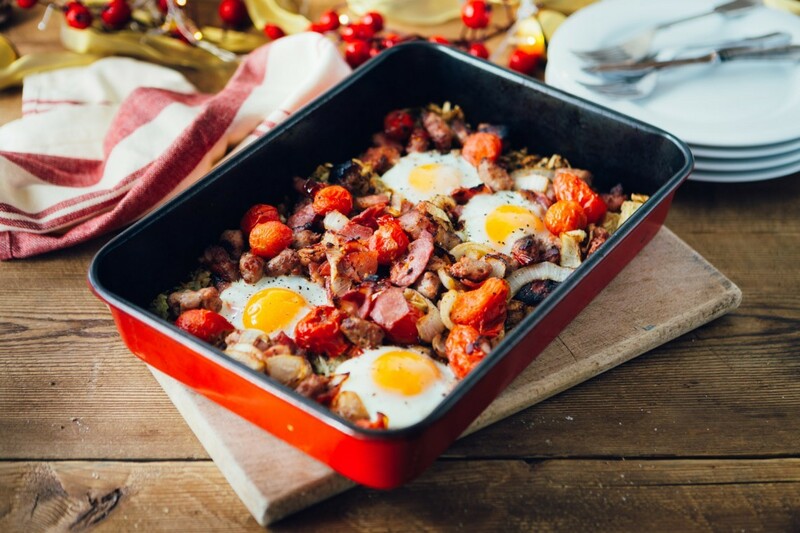 This tasty but simple recipe is great for cooking for the whole family on Christmas morning. 1In a large baking tray drizzle in some olive oil and place in the oven at 200 degrees. 2Grate the potatoes onto a clean tea towel. Over the sink wrap the potato up in the tea towel and squeeze all the excess water from the potatoes. 3Place the potatoes into a frying pan and brown for 5 minutes constantly moving it. 4Take the oil out the oven and in the baking tray place the potato as an even layer season with salt and pepper and pop back in the oven for 20 minutes. 5While the potato is cooking, cut the bacon into thin strips and remove the sausage meat from the skins and split into small balls. Fry theses along with the tomatoes in a frying pan until they get some colour. 6Add this mix to the potato that is in the oven. 7Leave in the oven for 15 minutes and then take out and crack the 4 eggs onto the top of the mix and pop back in the oven until the eggs are cooked roughly 10 minutes. 8Take out the oven and serve.